PIEDMONT – For the thousands around the state watching and listening to Thursday’s Class 3A state championship game between Piedmont and Flomaton it would be my guess most will tune in anticipating the outcome of the David versus Goliath mismatch. As the play-by-play radio voice of Piedmont football, I can assure you Bulldogs head coach Steve Smith never takes any opponent for granted. Nine years ago, Smith’s Bulldogs slayed their Goliath when Piedmont knocked off the second-ranked 13-1 Cordova Blue Devils in overtime at Bryant-Denny to claim the school’s first blue map trophy. In this year’s case, the part of David is being played by the unranked Flomaton Hurricanes. Not only are the Hurricanes unranked, the green and white didn’t receive a vote in the final Alabama Sports Writers Association poll. Rewind to the 2018 preseason rankings and you won’t see Flomaton on the ASWA radar, either. No one can fault the pollsters. The Canes were coming off 4-6 and 3-7 campaigns and hadn’t played in a postseason game since 2015. As for the Dawgs, they’ll be playing in their third state title tilt in the last four years. The 18 Piedmont seniors on this squad have posted an astonishing overall record of 53-5. In playoff games alone the graduating group are 17-1. Given that dynamic it’s certainly not a reach to thrust biblical character references into the epicenter of this story. In actuality, the expectations were a little different for both coaches. Atmore native Doug Vickery Jr. played for Flomaton his freshman and sophomore years before finishing out his high school career at Escambia Academy. In 2006, Vickery was hired as Flomaton’s head coach and has guided the Canes to an 88-57 record without claiming a region title. Three times his squads have been turned back in quarterfinal setbacks. Overall, he is respectable 114-95. As for Smith, he grew up in Centre and was an all-state quarterback playing for the legendary Bobby Johnson. The class valedictorian would take his talents to Jacksonville State and serve as a grad assistant on the Gamecocks 1992 National Championship team. Like Vickery, Smith made a coaching move in 2006, leaving Cedar Bluff to take over the Bulldogs program. Since moving to Piedmont, Smith added seven more region titles to the six he pocketed at Cedar Bluff. His 232 coaching victories place him in the top 30 all-time and the top 10 among active coaches. Heading into the season, there were few who thought Smith’s squad would win a fourth consecutive region title much less be playing for a third state title within the same time frame. It was a fair observation. The Dawgs lost 13 players to graduation and returned just four players as offensive starters. On top of that, 3A Region 6 rivals Randolph County and Saks (dropping down from 4A) secured the Nos. 1 and 6 spots, respectively, in the preseason poll and both drew first-place votes. Area football experts agreed a playoff berth awaited the Dawgs in the tough region and it wouldn’t have been a stretch to predict Piedmont in the quarterfinals but, if the truth were told, a shot at the semifinal or championship would just be a bonus for the Bulldogs. With region rivals like Mobile Christian and Bayside Academy (teams Piedmont beat for its 2016 and 2015 state titles), Thomasville and T.R. Miller, the chances of Coach V reaching those goals appeared pretty slim to any outsider. Like storm signs that are often dismissed, Vickery’s warnings fell on deaf ears. The Hurricanes finished runner-up to Mobile Christian in 3A Region 1 and will play for the state title Thursday morning. As for “enjoying the journey with all my boys” he can check that box, too. Thursday morning, two of Alabama’s finest will take the field to fight the good fight in an effort to bring home Alabama high school football’s most meaningful treasure. As both squads draw closer to kickoff, eyes will undoubtedly turn skyward as the eagle takes flight at Jordan-Hare Stadium and fingers will point as they trace the bird’s flight against the sky. As those eyes gaze skyward and those fingers are lifted up many will do so in remembrance of two exceptional individuals. Both Flomaton and Piedmont were dealt agonizing blows this season as cancer, in the form of glioblastoma, claimed the lives of two remarkable individuals in their communities. One, a former multi-sport standout and protector of the people he served. The other, a beloved student with talent and beauty beyond compare. Kevin Blue was a standout wide receiver for Alexandria High School and later played for Jacksonville State. He came to Piedmont as a city police officer and it didn’t take Kevin long to endear himself to the Piedmont community and Bulldog football team. Kevin passed away on Oct. 27 at age 51. His compassionate personality is terribly missed. Flomaton junior Kelsie Padgett lost her fight with glioblastoma as well, just two days after Kevin’s passing. Kelsie was a majorette and cheerleader for the Hurricanes. Her friends described her infectious faith serving as an inspiration to everyone. Like Kevin, the community rallied with multiple fund raisers in support of Kelsie of her fight. If form holds true Thursday, one team will walk sullenly toward the middle of field to claim the Red Map trophy signifying they came up shy of their ultimate goal. Retreating, they will ponder every “if only” scenario that would have altered the outcome in their favor. Directly across from them will stand the victors. Teenagers, trying to containing the buzz of nervous energy racing though their bodies. If tradition is followed, they will surge forward to seize the Blue Map. For the players, it’s a volcanic release of indescribable emotions. Months and months of sweat, pain and sacrifice are unharnessed. It’s their moment to rush into the spotlight. They’ll grab that beautiful blue map trophy and hoist it skyward. Still, the moment is fleeting. It’s here, then gone. Order on the field will soon be restored and the celebrations will continue elsewhere. Down the road there will be anniversary celebrations for both of these special squads. Memories, those will be everlasting. In the end, it’s just a game. No doubt it’s a great game and one we love, but it’s still a game. A moment in time. These two teams lived it. Kevin and Kelsie loved it. They loved their schools and they loved their communities. Red or Blue. No shame. Lift it up. Together. For Kevin. For Kelsie. Forever. 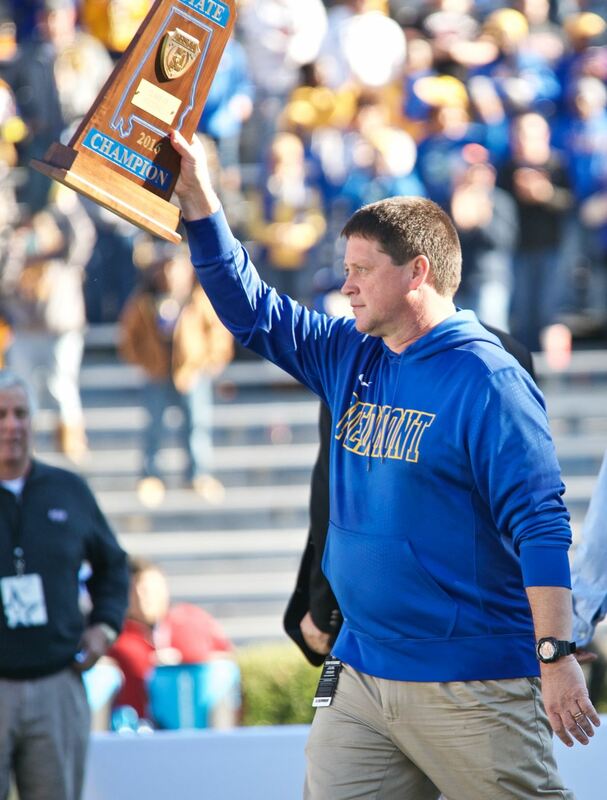 Kurt Duryea is the radio play-by-play broadcaster for Piedmont football. Thursday’s game can be found WCKA (810 AM, 94.3 FM, 97.1 FM).